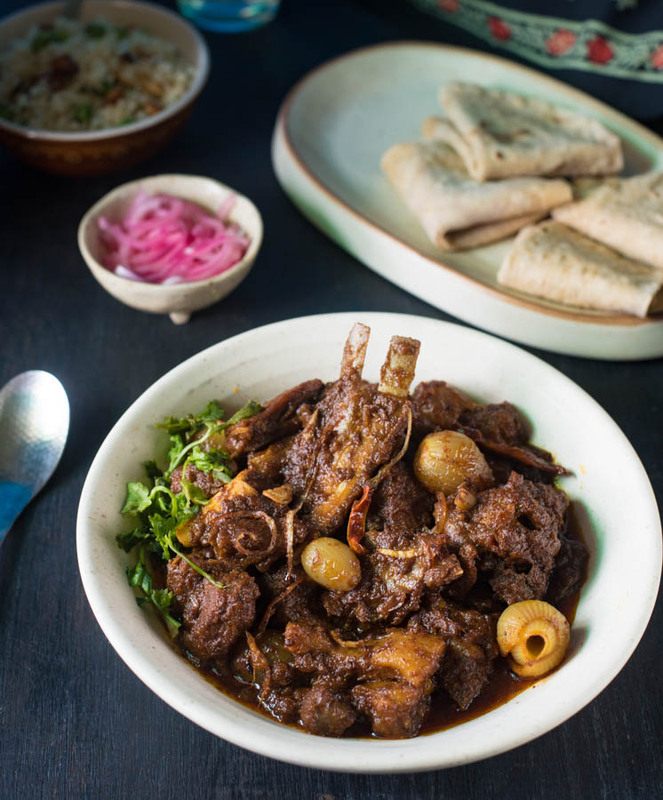 Now that winter is here t and we find reasons to veer towards the richer spicier gravies, let me present to you this rich, spicy, soul satisfying dish called Mutton Dopiyaja or dopyaja. Do piyaja literally means with two types of onions. Traditionally fried onion or birista and fresh onion are used to create a thick brownish gravy. But in my recipe, I have used onions thrice. 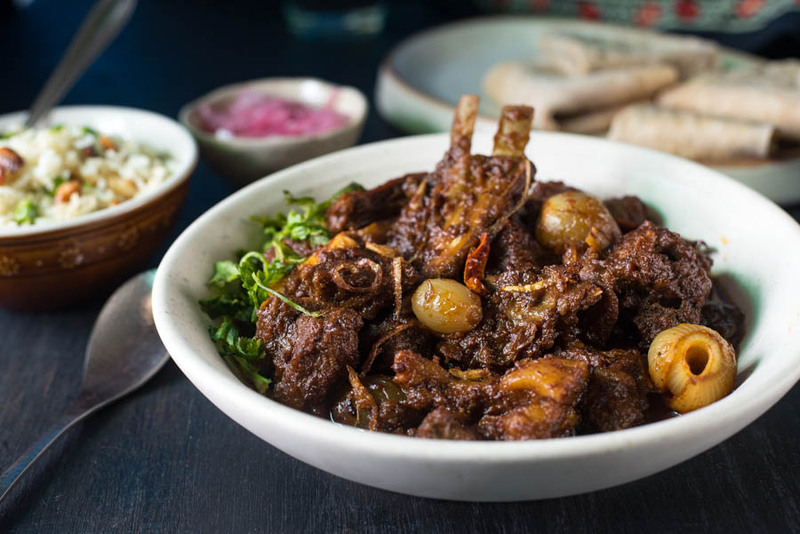 The third variant is those whole small purple onions, which I cook along with the mutton and by the time the dish is ready the whole onion becomes soft and jammy, a delightful addition to the succulent meat and spicy gravy. This recipe is based on my friend Soma's recipe who blogs at ecurry.com. If you haven't visited her blog yet please stop reading and go visit her page. Her pictures are a delight to the eyes and her writing would pull some strings in your heart for sure. She is the best when it comes to food styling and is the one who first started styling with items from a Bengali kitchen. Sarashi, pathorer thala (stone utensils from Kalighat) and Bengali copper bowls and spoons which are so much in vogue these days were definitely were put to use and popularised by her. This dish pairs best with Rotis or breads of any type. It's a luxury to tear a piece of soft bread to mop up the succulent piece of meat and the aromatic slightly sweetish yet spicy gravy. The separating dark hues armatic oil softens the bread even more and makes it a joyful experience. 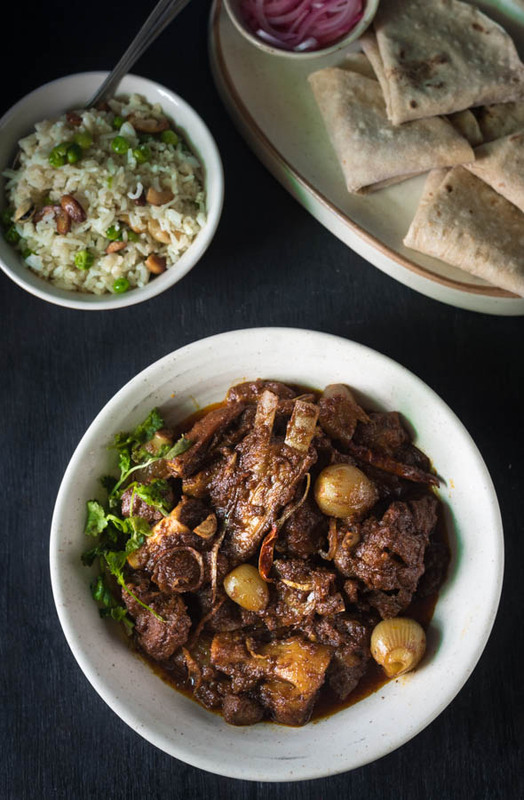 Like any other rich mutton recipe the ingredient list and cooking process is little lengthy yet I would urge you to slow cook it on low flame for that caramelisation and layering of flavours. I am writing down the pressure cooker method too which tastes good if you are in hurry but the slow cooked method would win any day over it. You can cook this recipe either in a pressure cooker or slow cook in a heavy bottom pan. I prefer to slowcook as mutton is a rare treat at home. I use raw papaya as meat tenderiser and this dish is done under a couple of hours at max. Wash and pat dry the mutton pieces. Add ginger garlic paste, 1 tbsp mustard oil. 1 tsp chilli powder, chilli paste, beaten yogurt, a pinch of garam masala and a pinch of salt. BEst if you can marinate it overnight else at least marinate for 3-4 hours. An hour before cooking add the raw papaya paste and mix properly. Heat the oil and fry 3/4 cup of sliced onion in three batches over medium flame. Fry till they are golden. take out with a slotted spoon as the onions keep cooking even after taking out from oil. Add the ghee to the same oil and once it's hot Pick up the mutton pieces from the marinade, shake off any excess and place in the oil. Just seal the meat on a medium flame for 3-4 minutes or till they change colour. Take off the pan and keep aside. Seal the meat in 2-3 batches, do not overcrowd the pan. Now in the same oil add lightly pounded whole spices. Let it splutter and release the aroma. Then add the chopped onion and sprinkle some salt on top. Cook on low flame so that the onion softens. It will take at least 10-12 minutes for the onion to fully cook and turn golden on the edges. The onions should be more of a jammy consistency than crisp. Stir often for even cooking and if needed sprinkle little water at a time to bring down the temperature of your pan. Add half of the marinade and coriander powder. Cook till oil starts to bubble on the sides. Now add the mutton along with the rest of the marinade, chilli powder (both type), Turmeric, salt as per taste and those whole shallots or small onions. Cook on a medium by stirring often to cook evenly. I prefer to cover the pan for a span of 5-6 minutes and then stirring up again. It will take close to 30-40 minutes for all the spices and yogurt to cook properly. Check the mutton for doneness once you see oil separating at the sides. Add 3/4 cup of warm water and the fried onions. Mix. Bring it to a boil and then simmer on low. Once the water is absorbed again check the doneness of the mutton. If needed add 1/4 cup more water. Continue till your mutton is done. We get very good quality meat here in India and I used 3/4 cup water and 2 more tablespoons later. Depending on how much gravy you want please adjust the water. We like it almost dryish with oil separating at the sides. Finally, sprinkle the garam masala powder and kewra water and mix. Let it stand for at least 15-20 minutes before serving. Wash the mutton and marinate as mentioned above for a couple of hours to overnight. Take out the mutton pieces by shaking off any marinade and place them in a pressure cooker with 3/4 cup water. Cook on medium for 2 whistles on medium. Let the steam dissipate in itself and then remove the lid. pick up the mutton pieces and fry them as mentioned above for 2-3 minutes and proceed in the same manner afterwards. Use the stock instead of water and cook till done.